March 6, 2019 – Press Release– EXPUNGEMENT CLINIC, Saturday, April 27, 2019 to be hosted by The Salvation Army located at 611 Stockell St. Nashville, TN 37207. The event will be held at the Magness-Potter Community Center (Salvation Army’s Red Shield East Campus). Check- In begins at 9:00 a.m. – LIMITED TO THE FIRST 100 REGISTRANTS!! NO WALKINS!!! January 9, 2019 – EXPUNGEMENT CLINIC, Saturday, February 23, 2019 to be hosted by Napier Community Center at 9:00 a.m. – 73 Fairfield Ave. Nashville, TN 37210 – LIMITED TO THE FIRST 100 REGISTRANTS!! NO WALKINS!!! Please refrain from emailing or calling Judge Rachel L. Bell directly. All interested applicants must submit an application for consideration through Metro HR with Government Jobs. December 15,2018 – EXPUNGEMENT CLINIC, Saturday, December 15, 2018 to be hosted at Andrew Jackson Boys & Girls Club 916 16th Ave N, Nashville, TN 37208. Limited to the first 100 registered. NO Walk-Ins! September 15, 2018 – Press Release, Expungement Clinic with the National Prison Summit to be hosted on Saturday, October 27, 2018 at Cathedral of Praise, 4300 Clarksville Highway, Nashville, TN 37218. Limited to the first 100 registered. September 3, 2018– The International Association of LGBT Judges celebrates Judge Rachel L. Bell reaching a milestone and coming out!! July 23, 2018 – EXPUNGEMENT CLINIC, Saturday, August 18, 2018 to be hosted by New Covenant Christian Church AT 9:00 a.m. – 2201 Osage St, Nashville, TN 37208. LIMITED TO THE FIRST 100 REGISTRANTS!! NO WALKINS!! May 17, 2018 – Press Release- Expungement Clinic, Saturday, June 9, 2018 to be hosted at The Village Church located at Fifty Forward in Madison, TN, address- 301 Madison Street, Madison, TN 37115. Limited to the first 100 registered. April 12, 2018 – Press Release- EXPUNGEMENT CLINIC, Saturday May 12, 2018 to be hosted at Salvation Army at 9:00 a.m.- 611 Stockell Street, Nashville, TN 37207- LIMITED TO THE FIRST 100 REGISTRANTS !!! November 30, 2017 – Judge Rachel announces the C.A.R.E. (Creating Avenues for Restoration and Empowerment) partnership launch with the Urban League of Middle TN. September 14, 2017 – Judge Rachel to attend the Nashville Good Neighbor Celebration Day on September 30, 2017. July 27, 2017 – Judge Rachel and the Bordeaux North Nashville Literacy Partnership host Book Fiesta Ceremony for R.E.A.C.H. (Reaching Every Aspiring Child’s Horizon) at MNPS, Robert Churchwell Museum Magnet Elementary School. July 24, 2017 – Judge Rachel congratulates R.E.A.C.H. (Reaching Every Aspiring Child’s Horizon) students during Book Fiesta ceremony with 18th Ave. Family Enrichment Center. July 14, 2017 – Judge Rachel shares her LGBT story and is featured on the front cover of FOCUS magazine for Middle TN and its allies. July 13, 2017 – Judge Rachel host the Government Module from the General Sessions Music City Community Court FUTURE Internship Summer program for the Dr. Katherine Y. Brown Leadership Academy’s International Cohort. June 9, 2017 – Judge Rachel makes history as Nashville, Davidson County, TN, first openly gay judge by marrying Dr. Dorsha N. James. June 3,2017 – Judge Rachel got married and became the first openly gay elected Judge in Nashville, TN. February 28, 2017 – Press Release- G.S. 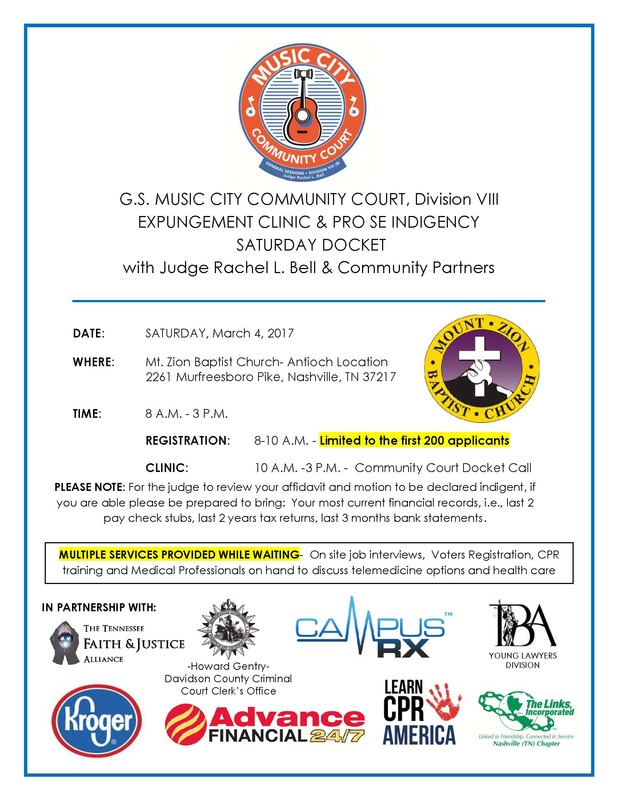 Music City Community Court- Saturday-Pro Se Indigence Docket & Expungement Clinic to be hosted on Saturday, March 4, 2017 19, 2016 at 8 a.m. at Mt. Zion Baptist Church- Antioch Location, 2261 Murfreesboro Rd. Nashville, TN 37217- LIMITED TO THE FIRST 200 REGISTRANTS!! February 16, 2017 – Judge Rachel facilitates the Bordeaux-North Nashville Chamber of Commerce Black History month annual meeting. February 9, 2017 – Judge Rachel and community activist Carla Hudson organize a conversation about the 13th Amendment and the Criminal Justice System. January 26, 2017 – Judge Rachel to moderate a Civil Rights and Criminal Justice panel for the public about mass incarceration and the 13th Amendment.